Twitter’s recent overhaul of its terms of service means users can no longer schedule tweets with identical content across multiple accounts, which is a great thing for users — it means more original content on the platform and less spam and bots. But if you’ve been sharing duplicative — and very genuine — messages across multiple accounts, these new rules are no doubt a bad thing for your productivity. After all, sharing the same messages across more than one account is super easy to automate, but writing completely new tweets every time? It’s a lot of work. Posting duplicative or substantially similar content, replies, or mentions over multiple accounts you control… is never allowed. So, obviously, if you want to promote a post you’ve just published, you can’t copy and paste the same tweet and broadcast it to several different Twitter accounts, or even the same account. Because if you do, you risk losing your Twitter account. Some news sites haven’t yet got the memo, like Gigaom, which is still broadcasting duplicate content. Check out the times in the two tweets below. Identical content posted on the same day. But what the new rules don’t make clear is what “substantially similar” means. Is it enough to simply change one word in a tweet or do you have to completely re-write the whole message? Twitter has left this part open to interpretation, so it’s up to users to make judgment calls on whether two tweets are “substantially similar” or not. If you want to continue to schedule tweets across multiple accounts while playing by Twitter’s new rules, it means getting into the habit of sharing variations of your tweets. So in this post, I’ll share 7 simple ways you can schedule tweets with variations, along with examples of how brands are already using these methods to play it safe. But first, let’s take a look at why you should be re-sharing tweets, and schedule tweets with variations in the first place. Should you share social media posts multiple times? When you publish a blog post and share it once on Twitter, you’re bound to get some engagement, shares, and traffic to your site. So when you publish two posts in one day and share both of them on Twitter, it means double the results, right? But what if you shared the same blog post twice in one day? And maybe again the next day? And again a week later? Wouldn’t that mean even bigger and better results for that one post? The thing is, people don’t constantly scroll Twitter all day so they’re bound to miss tweets. And if you’re targeting users in different countries and time zones, what some people might see in the morning, others might miss during their evening. 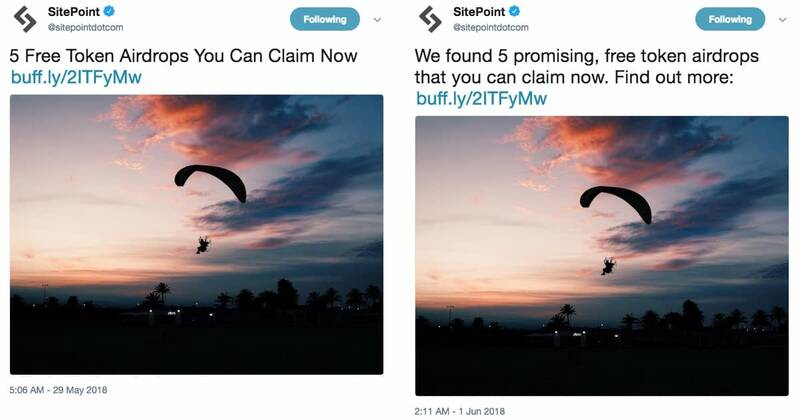 Sharing the same post to Twitter multiple times makes sense — you might not catch a user the first time or even the second time with your tweet, but they could see your third tweet and click through to your site. For more on the best times to schedule tweets, check out Data Says: Best Times to Post on Social Media – Twitter, Facebook, Instagram + More. Scheduling one tweet to broadcast across multiple accounts takes no time at all. Using tools like Buffer, HootSuite and Sprout Social, it’s easy to re-share the same tweet to publish over and over. But this practice now runs the risk of raising Twitter’s red flags. While it will take a bit of extra time to schedule tweets with variations, it is possible to speed up the process when you want to post the same content more than once. Using the simple variations of tweets below, you can quickly re-write and schedule tweets messages for Twitter, ensuring each and every message is unique. Note: To help speed up the re-writing process, I’ve put together a set of example tweet variation templates you can follow to help you quickly re-frame and schedule tweets. Scroll to the bottom for more. Let’s start with the easiest of these 7 tweet variations: simply sharing your post’s title and URL. It’s easy, straight-forward, and users know exactly what they’re getting. Why complicate things? When you’re in a rush to schedule your social media, this is one of the easiest variations you can use to schedule tweets. Another tactic is to take a tweet you’ve already written and just say it a different way. Sounds simple, right? Because it really is. 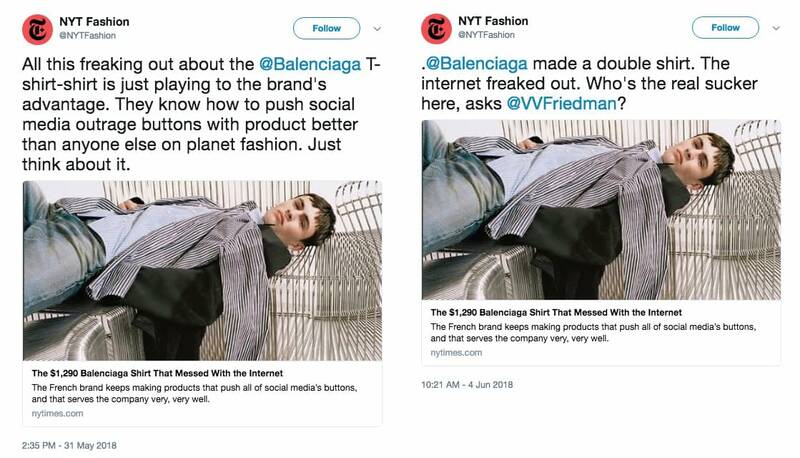 Each of these tweets promotes the same opinion piece about the Internet ruckus that erupted when Balenciaga released this ridiculous new outfit. The exact same content is shared in each tweet, just with a little re-wording to make each tweet distinct. Lengthy blog posts — and even shorter ones around 500 words — usually make more than one point, and feature different sections under different sub-headings. So rather than focus on highlighting the same information over and over in your tweets, why not call attention to other interesting angles and points in your posts? For example, for its article about job growth and unemployment in the U.S. during May, FiveThirtyEight highlighted in one tweet that the unemployment rate is a useful figure for economists, but doesn’t really capture how people think about it day-to-day. But in a second tweet promoting the same article, the statistical analysis news site explains how each month’s job growth figures are calculated. Blog posts usually focus on one topic, but it’s not unusual to deviate from that theme and explore other points to support the overall argument. When you look at posts this way, suddenly you’ve got a heap of content from your WordPress website that you can share on Twitter—it’s right there in your post waiting to be tweeted. Asking your followers a question is another easy way to re-frame tweets. Think of this method like a “conversation starter” that draws people into your content. Posing a rhetorical question compels users to think about what you’ve asked and then click on the link in your tweet to find out more. It also helps users feel like they’re part of a conversation. This tactic isn’t just great as another way to vary your tweets and get around duplicative content – it’s also a clever way to entice clicks and pique interest in your blog posts. Another quick way to change up your tweets is to use a quote. It doesn’t matter whether you use an actual quote from your blog post or simply quote the author, just choose a couple of the best lines in your post and copy-paste them into tweets. 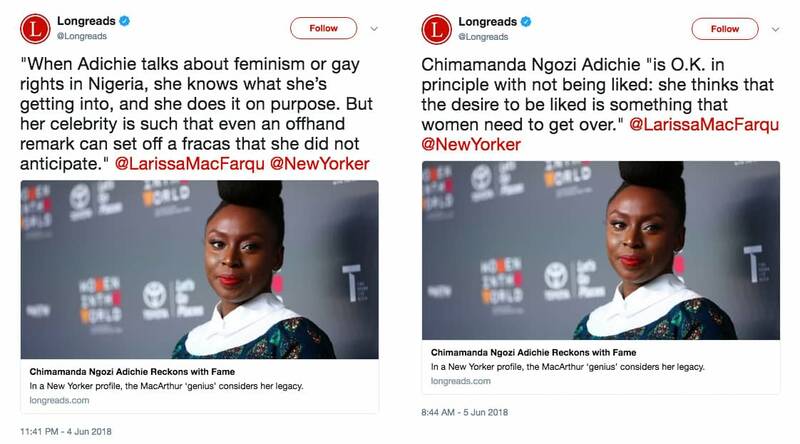 Each of the quotes in these tweets focuses on different aspects of the article being promoted—the first highlighting Adichie’s influence in her native Nigeria, while the second tweet focuses on her thinking that women need to get over their desire to be liked. Using different quotes that focus on different parts of a blog post can help you easily put together several tweets in no time. If your posts feature interesting facts and statistics, you’ve got a goldmine of juicy tidbits to share with your audience. Simply pick out the best numbers and drop them into your tweets. Let’s take a look at another example, again from FiveThirtyEight. In this tweet about Starbucks’ diversity training, the news site takes a shot at the coffee chain. When you’re scrolling through a Twitter account that has re-shared content, it’s easy to pick it out – you’ll see the same images appear over and over, which can quickly get boring. To avoid this, why not use different media? Tweets that feature different media, like images, GIFs, and Twitter cards have been proven to increase engagement. 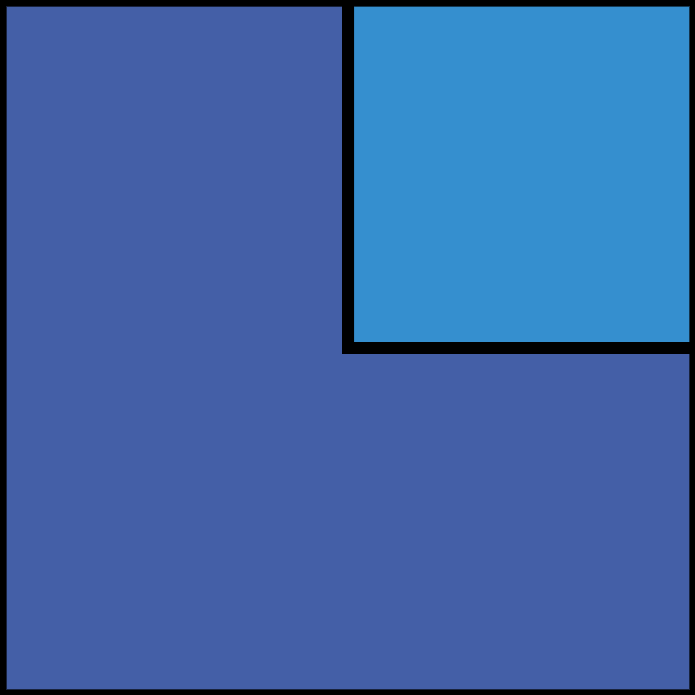 According to Buffer, tweets with images receive 150% more retweets than tweets without images. So when you want to re-share the same content, varying the messages in your tweets and varying the media is a sure-fire way to get more engagement. In the first tweet, the tech news site uses the image in the tweet to highlight a statistic featured in the story about the state of the U.S. government’s cybersecurity. 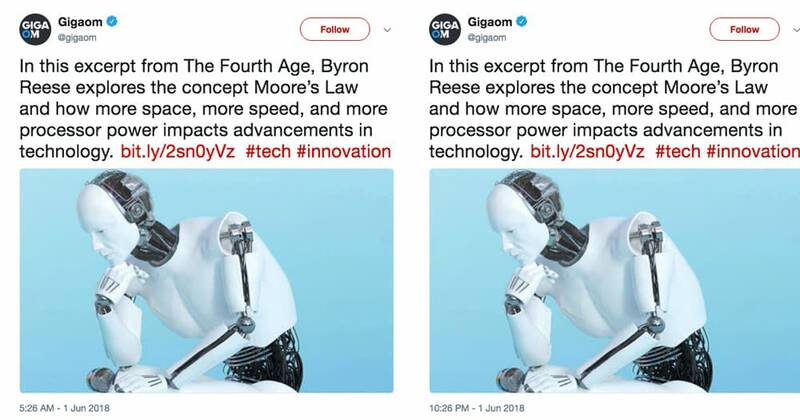 In the second tweet, Wired highlights a different quote, while also changing up the message shared in the tweet. 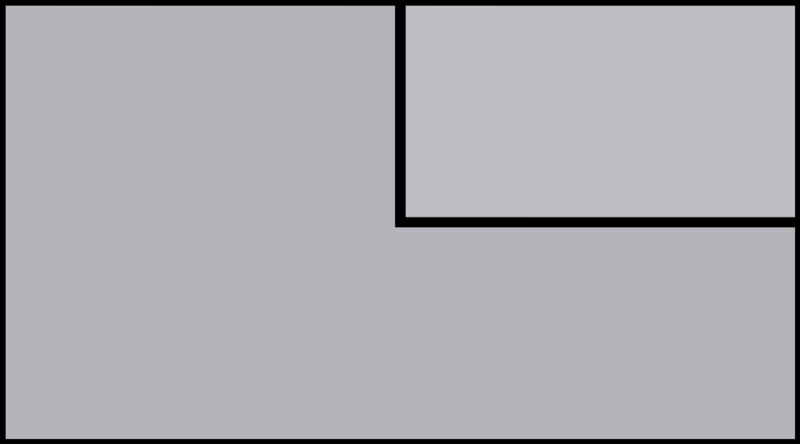 Obviously, this method takes a bit more work – you’re not just re-writing the tweet, but also creating a second image. But for followers who scroll through your account, this tactic is eye-catching. The images jump out at you since they look similar but contain different information, enticing you to click to find out more. The Revive Old Post plugin allows you to create variations on the social media messages associated with your posts. All you need to do is scroll down to the bottom of the post in your WordPress editor and enter the text you want to use. You can create as many variations as you want for each article. Writing variations of your tweets will take a little time to get used to. So to help you get into the habit, I’ve put together some example templates of variations based on the content in this very post. Don’t forget to bookmark this handy reference for the next time you schedule tweets! You’ll need to use your imagination for this one! Look to the FiveThirtyEight and Flywheel examples above and create different images for your tweets that highlight key information or feature other artwork or content from your post. Mixing up your messages with different variations based on the 7 methods above will not only ensure you’re playing it safe by Twitter’s new rules, but you’re also bound to attract greater engagement when you schedule tweets. Another plus is that followers won’t get tired of seeing the same messages multiple times. It’s more work, yes, but it also means more original content for users and potentially more traffic to your website. One last tactic for social media managers who post to multiple accounts: simply re-tweet. Once you’ve posted to one account, you can switch to the other and re-tweet the first account. It’s probably the easiest way to get around Twitter’s terms of service update and ensure you don’t get into trouble and save time. What are your techniques for creating tweet variations to avoid duplicative content? Share some favorite tactics in the comments below!